Seven years after the financial crisis of 2008, financiers remain villains in the public mind. Most Americans believe that their irresponsible actions and complex financial products wrecked the economy and destroyed people's savings, and that bankers never adequately paid for their crimes. But as Economist journalist Andrew Palmer argues in Smart Money, this much maligned industry is not only capable of doing great good for society, but offers the most powerful means we have for solving some of our most intractable social problems. From Babylon to the present, the history of finance has always been one of powerful innovation. Now a new generation of financial entrepreneurs is working to revive this tradition of useful innovation, and Palmer shows why we need their ideas today more than ever. Traveling to the centers of finance across the world, Palmer introduces us to peer-to-peer lenders who are financing entrepreneurs the big banks won't bet on, creating opportunities where none existed. He explores the world of social-impact bonds, which fund programs for the impoverished and homeless, simultaneously easing the burden on national governments and producing better results. And he explores the idea of human-capital contracts, whereby investors fund the educations of cash-strapped young people in return for a percentage of their future earnings. 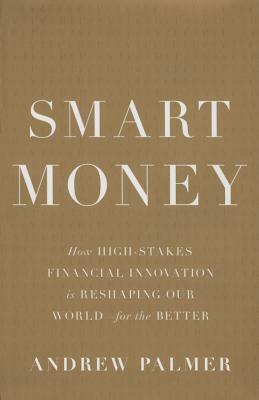 In this far-ranging tour of the extraordinarily creative financial ideas of today and of the future, Smart Money offers an inspiring look at the new era of financial innovation that promises to benefit us all. Andrew Palmer has worked at the Economist since 2007, and was its finance editor from 2009 to 2013. He is currently the Business Affairs editor at the Economist, where he is responsible for coverage of business, finance, and science. He has a master's degree in international relations from the London School of Economics and lives in London.